This ceiling mounted mirror is ideal at 90° right angle corners where space is limited in corridors and passageways. Ideal for busy corridors such as schools, hospitals, office buildings and reception areas, the quarter dome can help prevent collisions and accidents. Also used for security surveillance of store shelves, partitions and aisles. 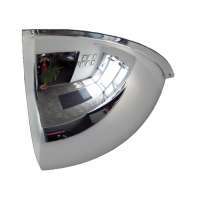 Mounted to the ceiling with the supplied dome capped screws this mirror gives a clear reflection without distortion. 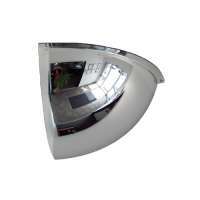 The 600mm Quarter Dome Mirror is ceiling mounted and is perfect for 90° right angle corners where space is limited. A quarter dome can help prevent collisions and accidents in busy corridors such as schools, hospitals, office buildings and reception areas. Also used for security and observation of s.. The 900mm Quarter Dome Mirror is ceiling mounted and is perfect for 90° right angle corners where space is limited. A quarter dome can help prevent collisions and accidents in busy corridors such as schools, hospitals, office buildings and reception areas. Also used for security and observation of s.. The 1200mm Quarter Dome Mirror is ceiling mounted and is perfect for 90° right angle corners where space is limited. 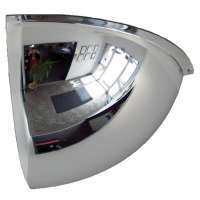 A quarter dome can help prevent collisions and accidents in busy corridors such as schools, hospitals, office buildings and reception areas. Also used for security and observation of ..